Condition:Dry skin or hair in need of comprehensive moisturization and nourishment. 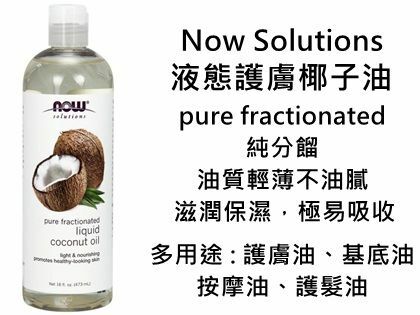 Solution:NOW® Solutions Liquid Coconut Oil is a versatile cosmetic oil that's pleasingly light and easily absorbed for comprehensive moisturization without clogged pores. Our fractionated Liquid Coconut Oil is colorless and odorless with a smooth, non-greasy texture that's ideal for a variety of personal care uses. Use it for dry skin, as a carrier oil for essential oils, for massage therapy, or as a base for handmade skin care products. Liquid Coconut Oil can also help to soften dry, damaged hair as well as add a healthy shine.